Four bedroom cottage for rent. Located 12 miles north of Harbor Springs on scenic M-119 (the nationally-renowned “Tunnel of Trees”) in Good Hart, Michigan. Great area for cyclists (last leg of the DALMAC bike tour). We prefer Saturday to Saturday rentals during June-August. Nearly 2,000 sq. ft., the house features beautiful sunset-facing, Lake Michigan views from most rooms. Four bedrooms, three full baths - including master bedroom with king-sized, luxurious pillowtop bed, 1,000 threadcount bed linen, walk-in closet and adjoining full bath. There are two queen-sized pillowtop beds and another double-sized pillow top bed in the remaining three bedrooms. Contemporary finished basement. The house has three separate living areas, allowing for large family gatherings. Kitchen has a refrigerator and gas oven/range, dishwasher and microwave, washer and dryer, 4 HDTV's throughout the house (including 62' inch with surround sound stereo system in basement). There are two TVs equipped with Apple TV and two with Roku (available to stream Netflix, Hulu, HBO Now etc. plus local TV channels) and Blu-Ray DVD players, four stereo systems and basement rec room with ping pong table and card table - offering all the creature comforts of home. High-speed, wireless internet connection throughout the house. Bed linen, bath towels, cooking and eating utensils supplied by cottage owner. House located 400 feet from the road on heavily wooded 5+ acre lot offering secluded privacy. Beach easement located below property for private beach access. Two, township beaches within one mile of cottage. These access points allow for nice beach combing. Plenty of public and semi-private golf courses within easy driving distance. Recreational in-land lakes (Burt Lake, Crooked Lake, Pickerel Lake, Larks Lake, Douglas Lake and others) nearby. Nice unique shops and General Store with in walking distance. Just 20 minutes from Boyne Highlands golf and skiing. Seven miles south of the famed Legs Inn, Cross Village. Eight miles north of Pond Hill Farm and Harbor Springs Winery. Enjoy glass blowing at Good Hart Glass Works or crafting at Three Pines Studio. This property was purchased shortly after Pat cycled the DALMAC, and was introduced to the beauty of M 119 and Emmet County. It has brought many years of enjoyment to her friends and family. One bath located off the master bedroom; one located off the three bedrooms; and one located in the finished basement/game room. Good Hart is a quaint and renown village along M119 with a number of popular shops including the Good Hart General Store, Primitive Images, the Crepe trailer, and the A store. Our private easement path along Lamkin Dr. provides access to Lake Michigan. Wonderful view of Lake Michigan. Beaver Island can be spotted on clear days. An easement provides private beach access. Lake Michigan provides for an ever changing scene - seasonal serene to stormy vistas. High quality bed linens and towels are provided. Two wood burning fireplaces. One is located in great room and one is located in the family room. Wood is provided. Apple TV is also available. Wood burning stove, stereo and TV. Basic cleaning and paper supplies are provided. Ping pong, darts and poker table. Apple TV allows access to I tunes. HDTV's throughout the house. Wireless internet with printing capabilities. Apple TV and Roku. Relaxing location for a get away! This spacious cottage has a fireplace, full kitchen and plenty of bed/bathrooms for several guests. We had a warm fire in the fireplace every night which is wonderful in the winter. Utensils, Wi-Fi, linens and everything else needed for a comfortable stay was supplied by the owner, Pat. The Apple TV is a nice feature for nights when we just wanted to stay in and watch a documentary. The location was great too as we were only a few minutes drive from several Little Traverse Nature Conservancy sites. We were able to enjoy snowshoeing and cross-country skiing at the Goodhart-Farms Preserve just up Robinson Rd. The Petoskey Brewery is less than 30 minutes away where we had some interesting beers and cheesy fries! A very relaxing place to stay and I definitely plan to visit again! Overall it was a great place to stay with many amenities. For an up north cottage, it checked all of the boxes for comfort. The Fireplace was quite the bonus as we absolutely loved being warmed when we woke and when we returned from the ski hills. Bedrooms were comfortable and ample bathrooms for our group of 8. Full kitchen was nice as we cooked in mostly. While it was quite cold and windy, the view was worth venturing outside to take in. Wonderful overlook over Lake Michigan. I imagine this place would be amazing to stay in the summer. Pat was very good at contacting us prior to our arrival and had comprehensive instructions for our stay, which was appreciated. The only negative I would have is the distance from town. It was stated in the description that we would only be 10 minutes form the Ski Resorts. When we pulled up the directions to Nubs on our phones from the driveway, it gave 24 minutes, 3 different routes (we tried them all). Add in the winding roads and lack of salt on the roads (they use sand up there) that quickly took us into the 40+ minute range of quite stressful driving. Forgot my boots the first day and just rented boots as I would rather spend the money versus wasting an hour and a half driving. Thank you for your kind words, Randall. We are sorry about the roads. We double checked our VRBO site. Our site does state that the ski hills are about 20 minutes away. It also says that Harbor Springs is about 12 miles away. We hope that these two destinations were not transposed. Yes, the roads are hilly and winding; it is part of the areas beauty. We are glad there was snow for some good skiing. We hope you had some good family time and made some good memories. It was a slow start because of storms and power outage however, Patricia (owner) was very easy to get ahold of and quick to respond with necessary information. The property is great and won't hesitate to book again. We are so sorry about the power outage and glad Great Lakes Energy worked hard and quickly to restore power to the region. We are glad we could assist with your logistics and that the trip turned out as well as can be expected. We look forward to hearing from you again. We had a nice time as we always do at this property. Two weeks every summer for 20+ years. Been coming here for close to twenty years. Always enjoy! Awe. We appreciate your annual business! Thank you for your fabulous review. We loved our time spent here! It was the perfect location from the backyard peacefulness with a view of Lake Michigan, to the layout of the house, to the proximity to the best beaches and general store around! We hope to come back! We appreciate your support! We hope the views will be even better after trimming this fall. As part of saving our beautiful Oaks, we can only trim in the cooler months now. 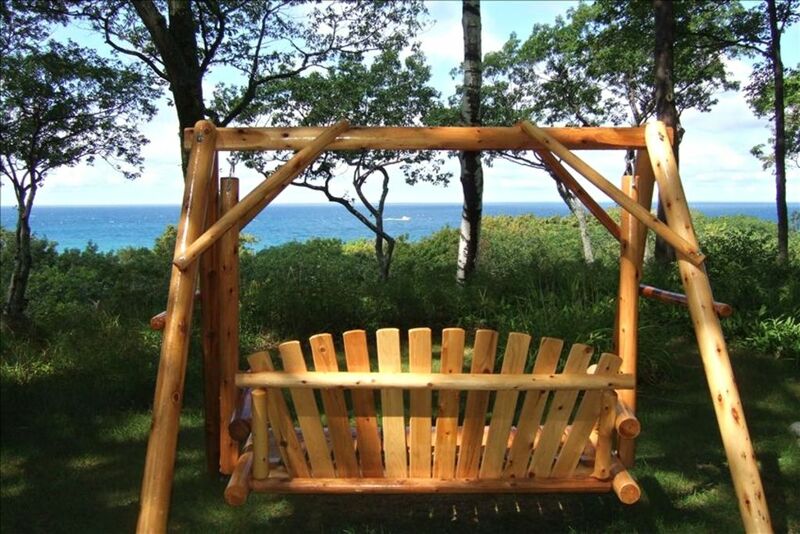 The cottage is located on 5+ acres with bluff views of Lake Michigan. Lake Michigan access is available through an easement at the bottom of the bluff and via township parks located at the bottom of the bluff with in 1 mile to the north and south on Lamkin Drive. The quaint town of Good Hart, and its unique and wonderful stores, is located within walking distance. Check-out is 11 AM; check-in is 4pm. Rental contract will be provided. We will assess an extra $100 fee for 8-10 people. The maximum party limit is 10. We provide fee waivers and discounts to our loyal return renters.